Wineries from Oregon, Washington and Idaho are invited to the Tri-Cities Wine Festival. 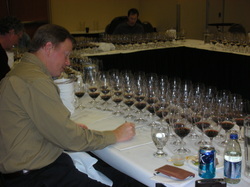 During the days before the Festival, a panel of well-qualified wine judges sample all the entries. These judges are drawn from an experienced pool of candidates from the United States and sometimes worldwide. Past judges have included well-recognized wine writers for major publications, sommeliers, wine distributors or buyers for major chains, winemakers and wine educators. Many have had extensive judging experience at such prestigious events as the Los Angeles County Wine Competition, the Dallas Wine Fair and international competitions. As in the past, judging is to be conducted under strict and exacting guidelines. Blind standards ensure an objective and unbiased examination of all entered wines. We follow the Wine Institute’s guidelines for objective competitions. The judges are told only the year and the category of each wine, and in some cases the residual sugar. The wines are randomized within each tasting round — or “flight” as they are called — to ensure that neither alphabetical order nor entry order can be a revealing factor. Flights are limited to no more than 20-24 wines. Should entries exceed that number (as in popular varietals such as Cabernet Sauvignon or Merlot), pass/fail flights first eliminate non-medal contenders. Wines that pass this round then go into a final flight for possible medal winners. Bronze, silver and gold medals are awarded, plus a best-of-show award. Best of show is selected from among the gold medal winners.